Stand in the posture of right hammi. Raise the ken above the head. 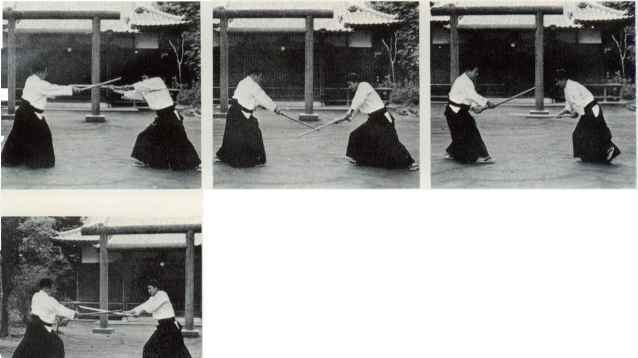 Cut obliquely up, extend the ken point to uke's chest, step out with the left foot and bring up the right (From this posture, movement can be made in any direction). 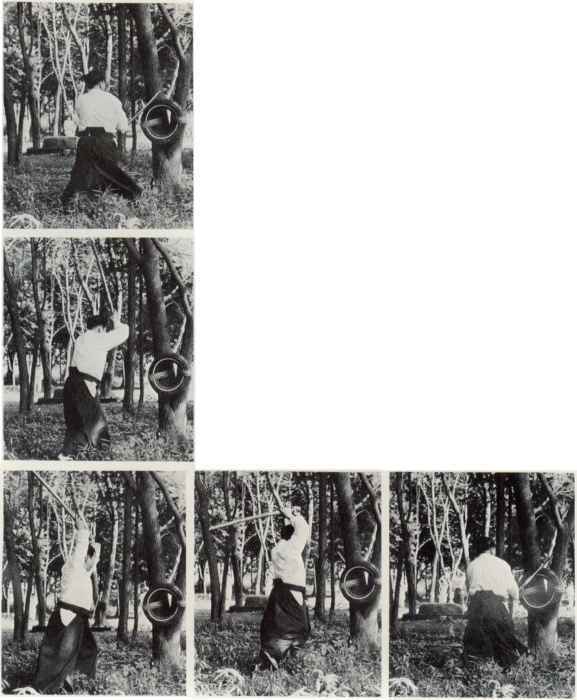 Take one step back with the left foot and strike down. Step forward with the left foot and strike. Defend by adopting the attitude of a tsuki. 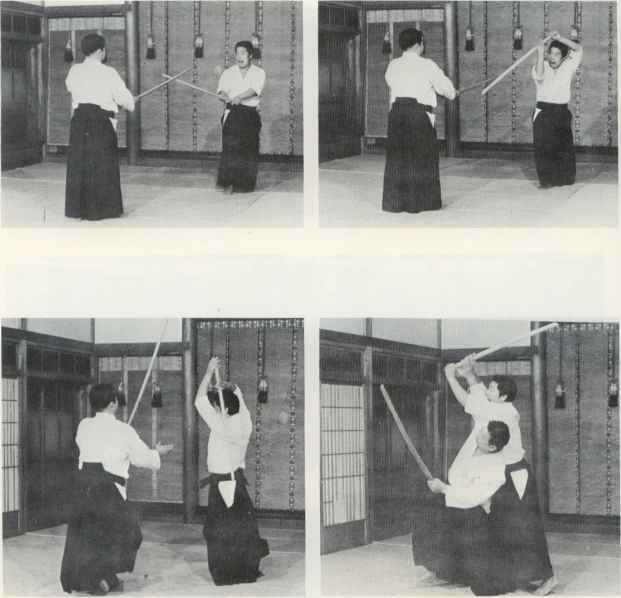 Strike again with renzoku uchikomi. During the blending of ki, raise the ken overhead. 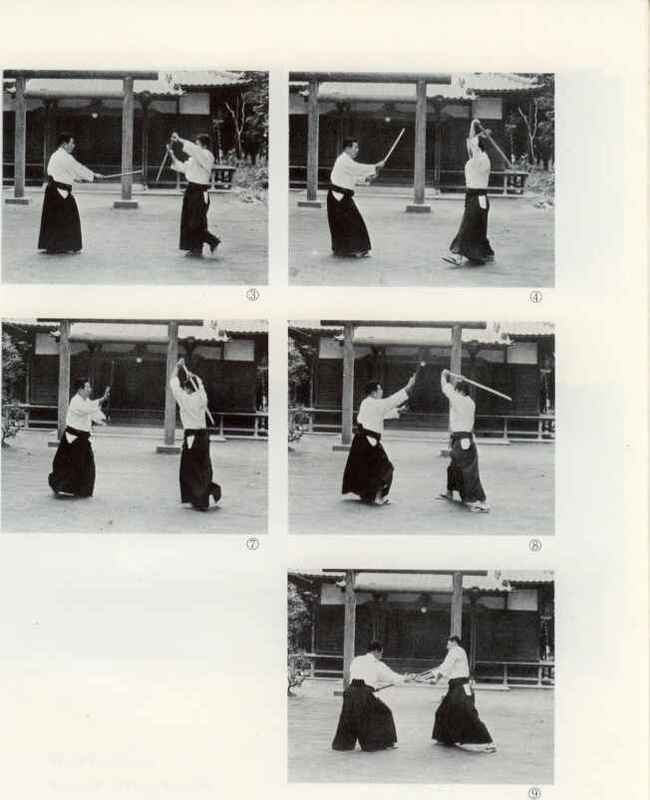 Defend by moving into hitoemi with the left foot. 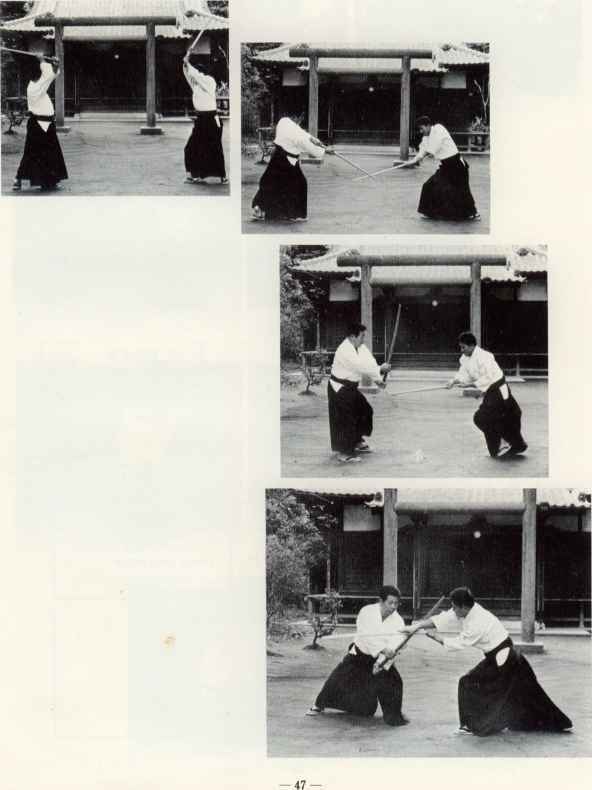 Aim at the opponent's leg and strike down. 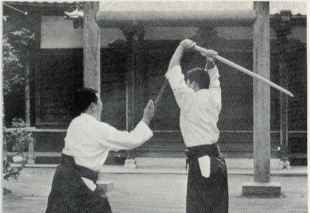 Intending to cut the opponent's wrist, raise the ken. 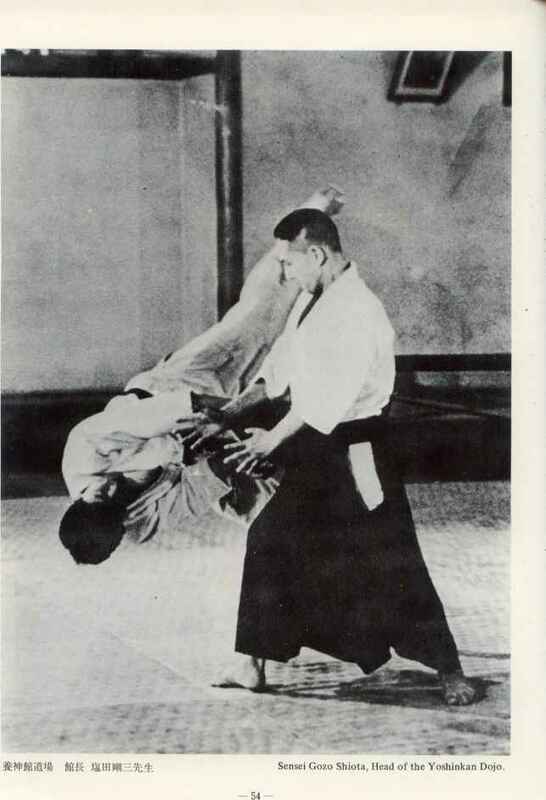 Follow uke's ken briskly from below as it is raised and thrust with the left foot forward. 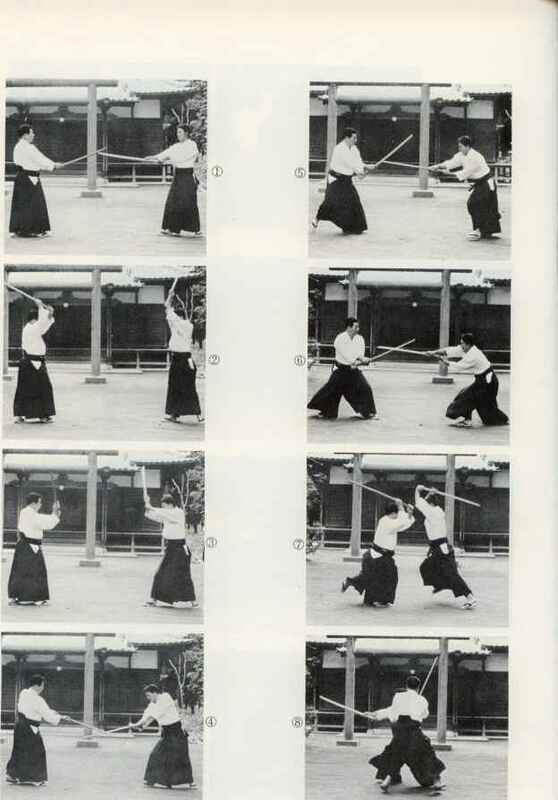 Step back with the right foot, adopt hitoemi, parry his thrust, and aim the ken point at his throat. Follow with a thrust stepping with the right foot. (Do not let the body cant at this time). Defend by stepping back with the left foot. Hold the opponent's ken down with your own. 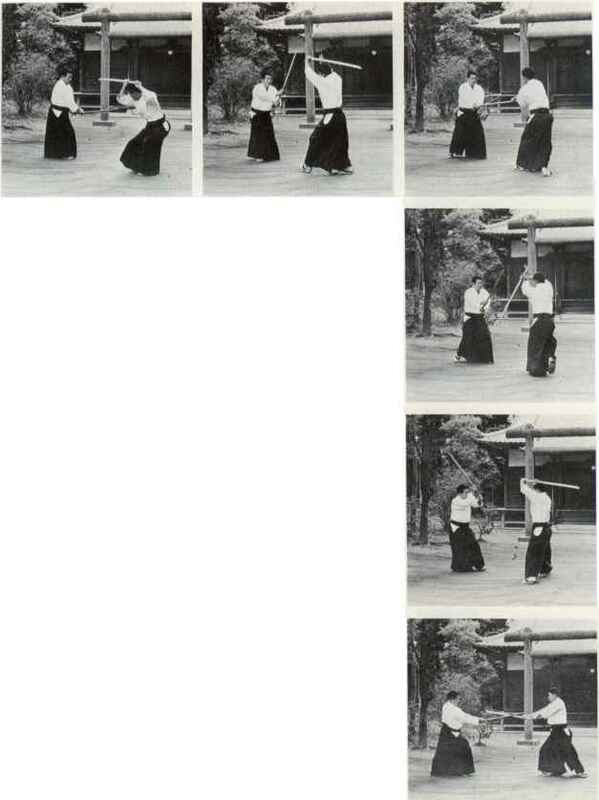 Do not resist uke's ken, pass your ken under, and thrust stepping forward with the left foot. 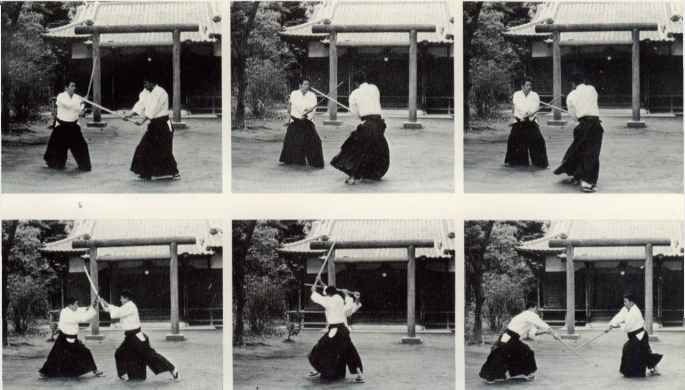 When the thrust comes, step back with the right foot and adopt an attitude of a tsuki. 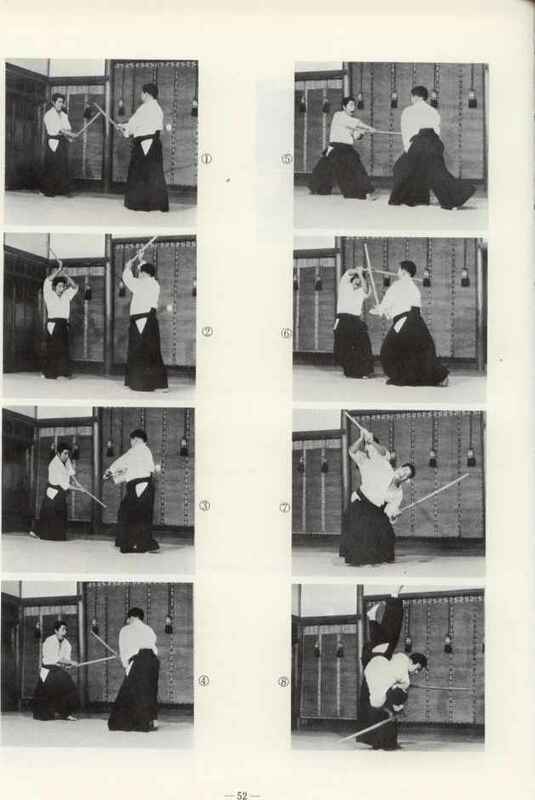 Step off to the right, parry his thrust. 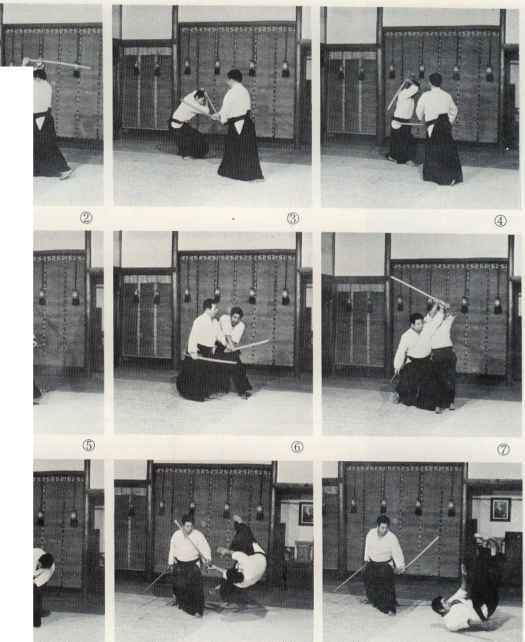 Finally, strike with a shomen uchi as shown. 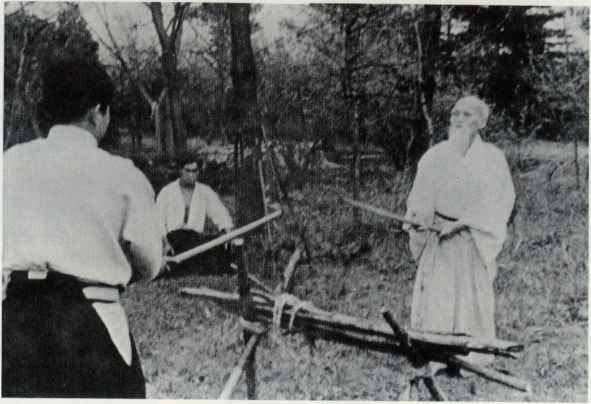 Aikido Headquarter's Dojo Instructor, Shoji Nishio at a demonstration. 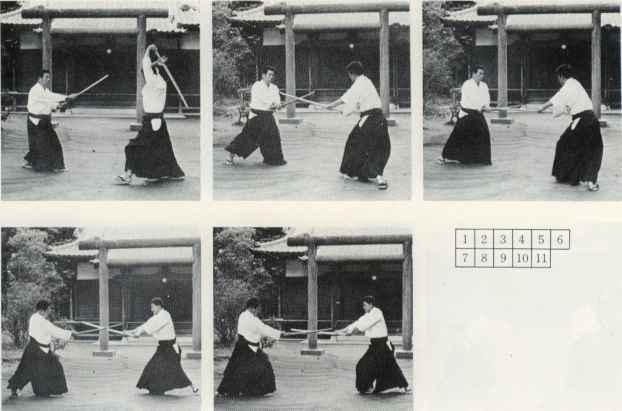 Hold down the opponent's ken lightly. Defend by stepping back with the right foot. 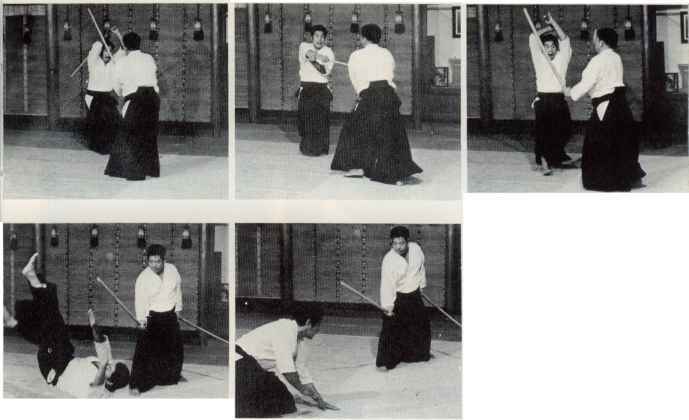 Step forward with the left foot to the left and respond with an uchi komi. Point your ken at the opponent's center line. 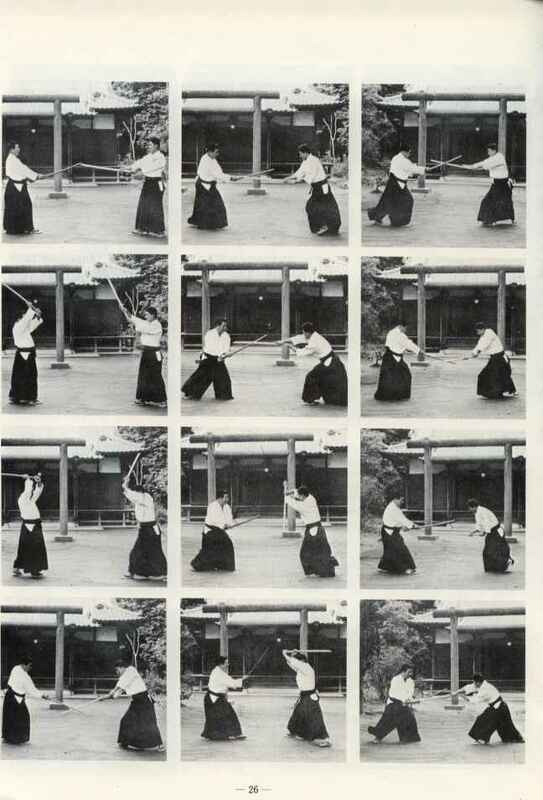 Step to the right and parry his thrust. 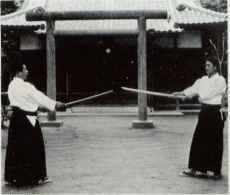 Defend in the position of hito e mi. 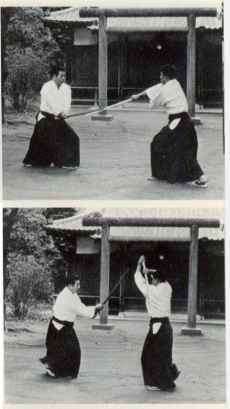 Pictures 4 ~ 11 show the renzoku uchi movement. Step forward on the right foot and tsuki. 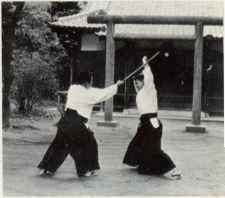 Move the left foot into the position of hito e mi. Hold your opponent's ken down. 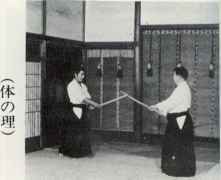 Stand in left hammi and defend with a tsuki. 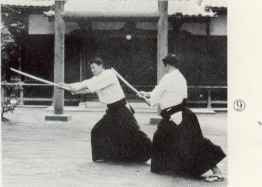 Step back with the left foot, defend as if cutting down, and adopt the attitude of a tsuki. 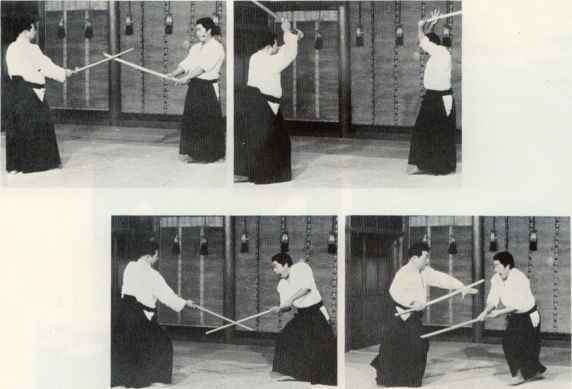 Parry his thrust and do an uchikomi. 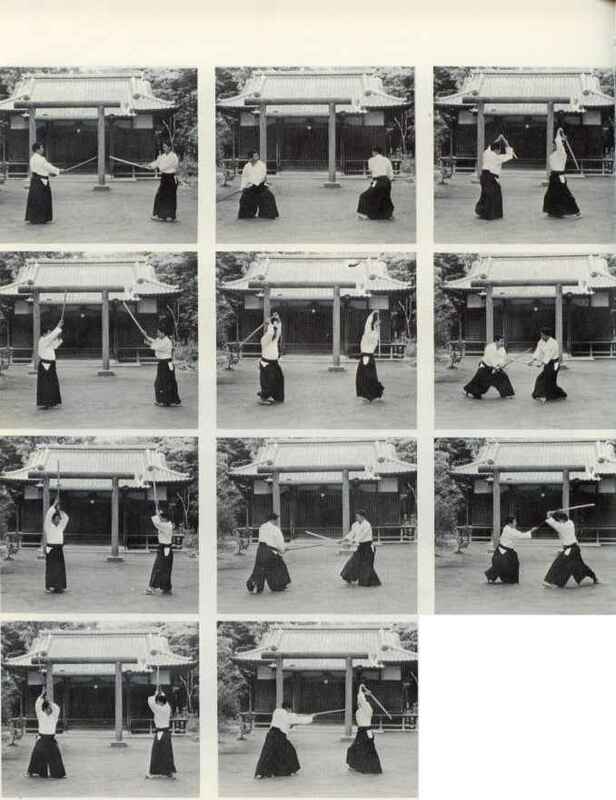 Step widely to the left with the left foot and strike down. Turn the body into left hammi and defend. move forward to grasp his ken. 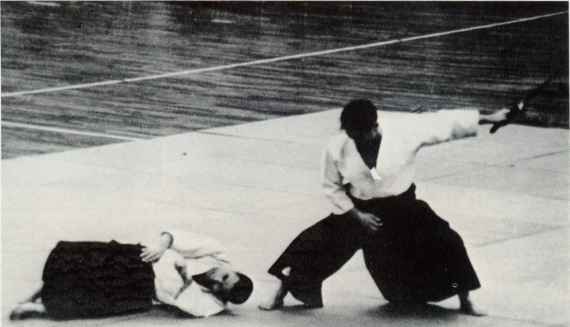 Do not grasp his ken but flow moving to the opponent's back and strike his leg. Blending ki, raise the ken up over the head breathing in deeply. Lower the ken to your right side. 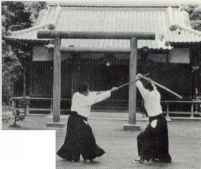 Thrust as the opponent raises his ken. 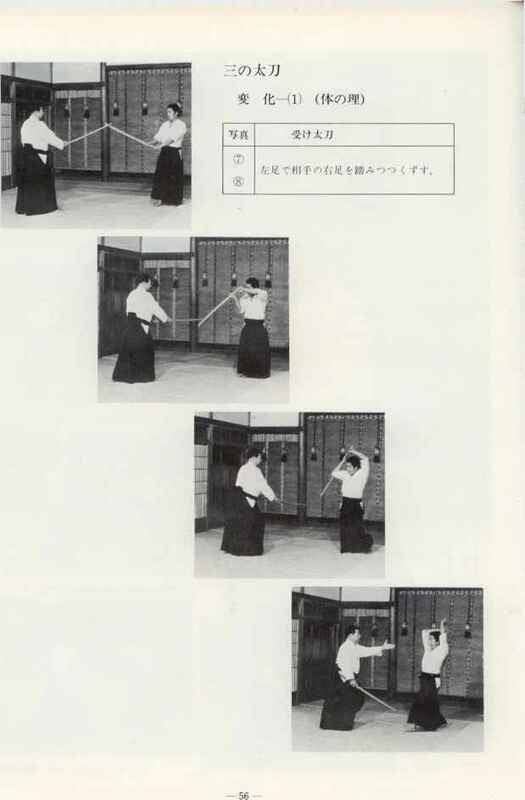 Make a flowing strike to the left. 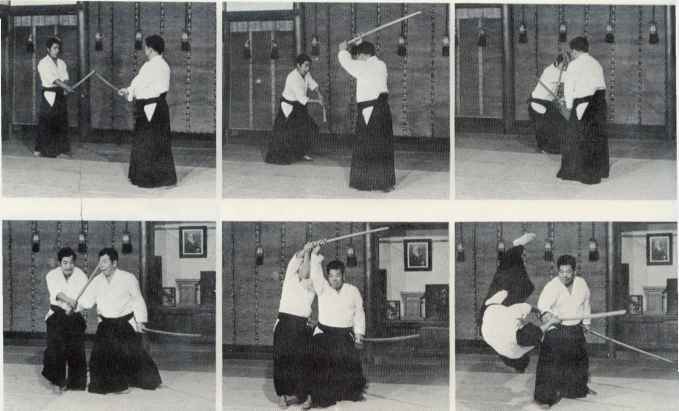 As shown, point the ken at your opponent for a thrust. From below, control your opponent's wrist. In preparation for another strike, raise the ken up over the head. Return to the initial stance. 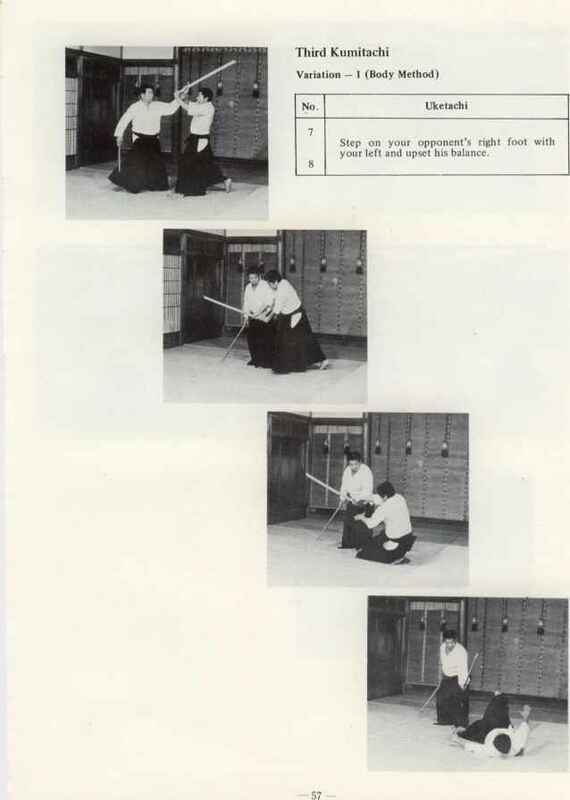 Withdraw one step while striking. Cut up across the abdomen. Grasp your opponent's ken. Raise your hand as if lifting your own ken and strike down. Withdrow one foot and strike. Step back with the right foot, defend. Advance the right foot forward and control your opponent's wrist. 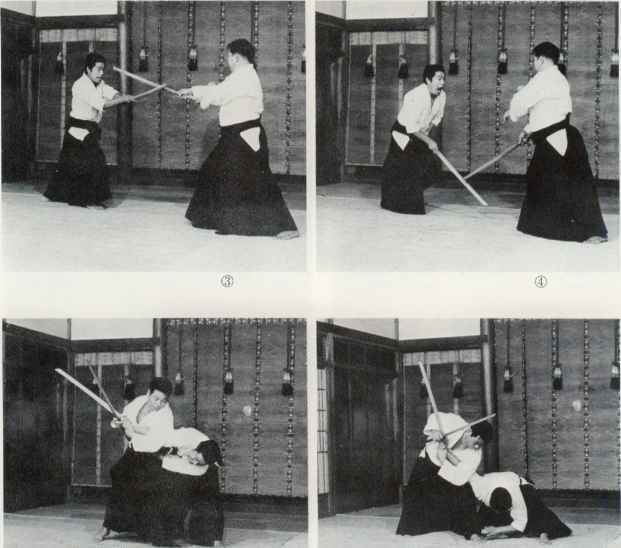 Prepare to strike with another uchi komi. Raise your hand when the opponent raises his ken. 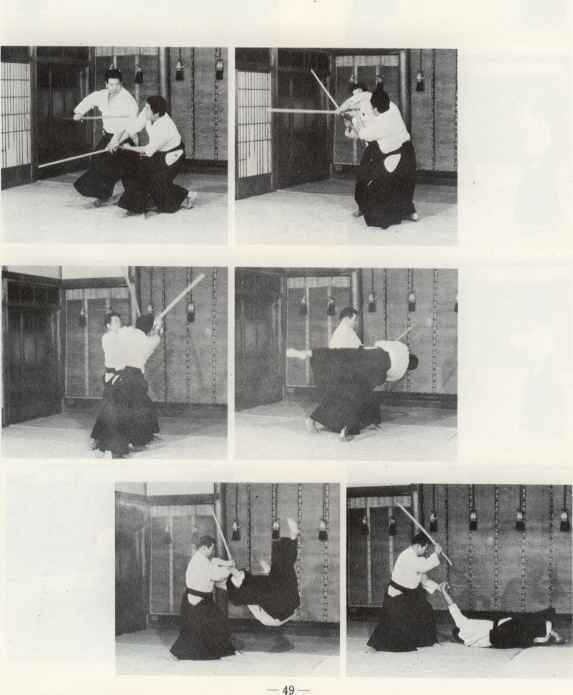 Grasp his ken when he strikes down. Control his elbow, and raise your hand. After throwing the opponent point his own ken at him. Raise the ken up over the head. 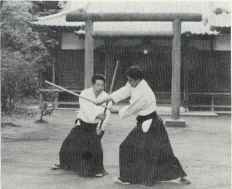 Flow with the opponent's thrust and turn to his side. Point your ken at his throat. 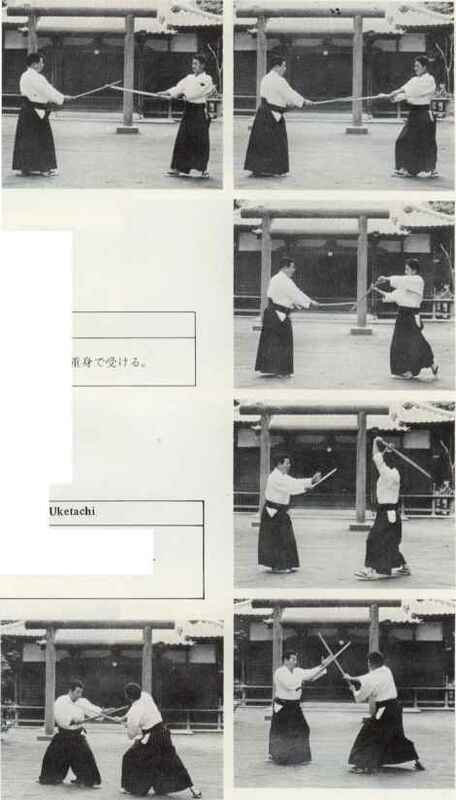 Grasp the back of the opponent's right hand with your left. Close the grip from the little finger. Step back with the left foot and turn the body. 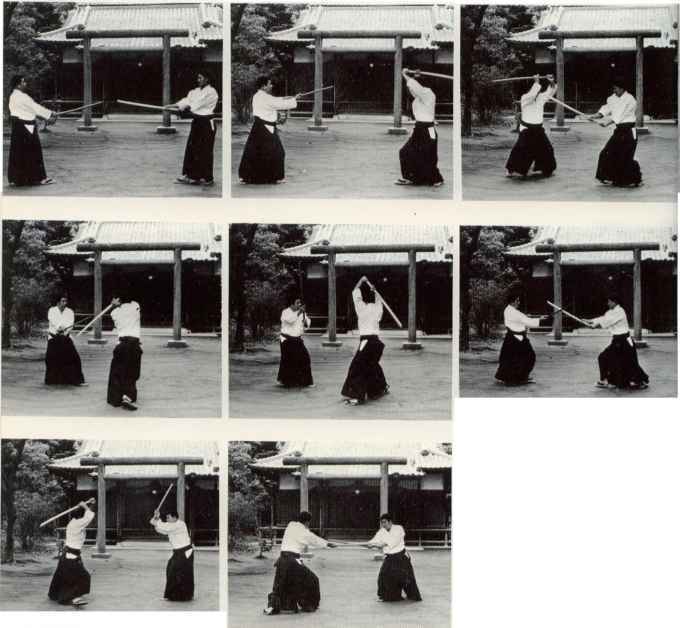 This practice is for entering deep to the opponent's rear, when holding a ken. 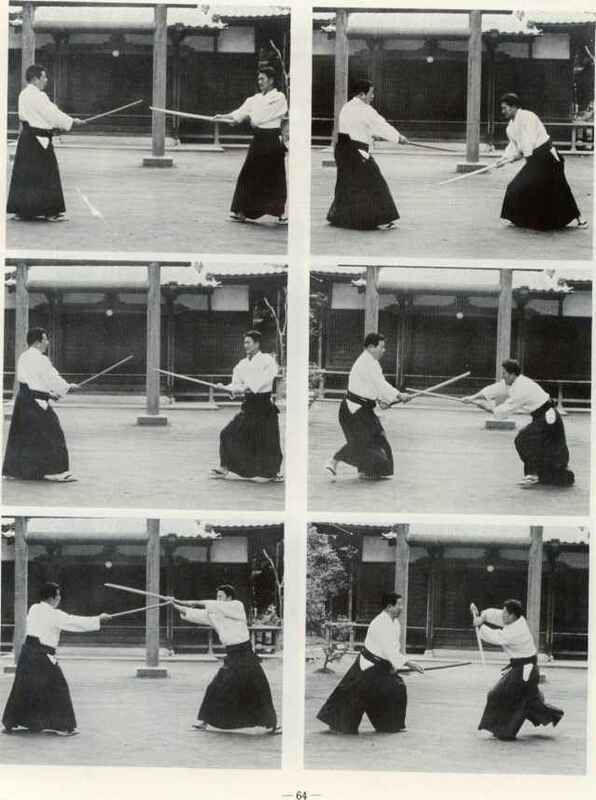 1) Your body and the opponent's form a cross. 2) Fully extend your hand toward the top of the wall and lower your hips. 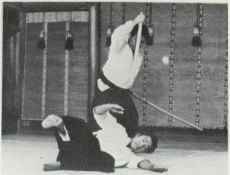 Hold the ken down with the left hand Stand in hito e mi. This has the same meaning as variation - 1. 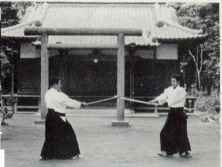 Refer to the Second Kumitachi Variation — 2 (Body Method). 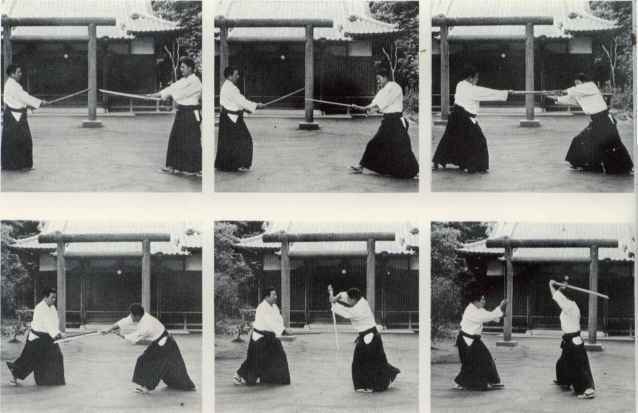 Compare the pictures of the Fourth Kumitachi, the Second Kumitachi Variation - 1 (Body Method), and see the picture below. Try and develop new techniques. 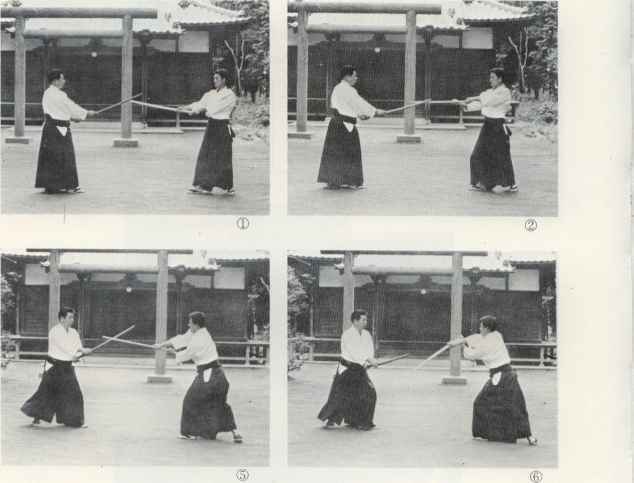 While making a wide turn, control the opponent's elbow.